So your kids love the Star Wars as much as you do. They watch the movies; they play with the toys. They want to dress up as a Jedi Knight for Halloween, or maybe they just dig lightsabers. Awesome; this is every grown-up nerd’s dream come true. But those plastic telescoping official lightsabers are a little lacking. I mean, they’re cool and all, I guess, but they’re obviously toys. The handle is oversized and the blade is too short. It’s fine for most kids, but some are more discerning. That’s where you want to get something a bit more…more. 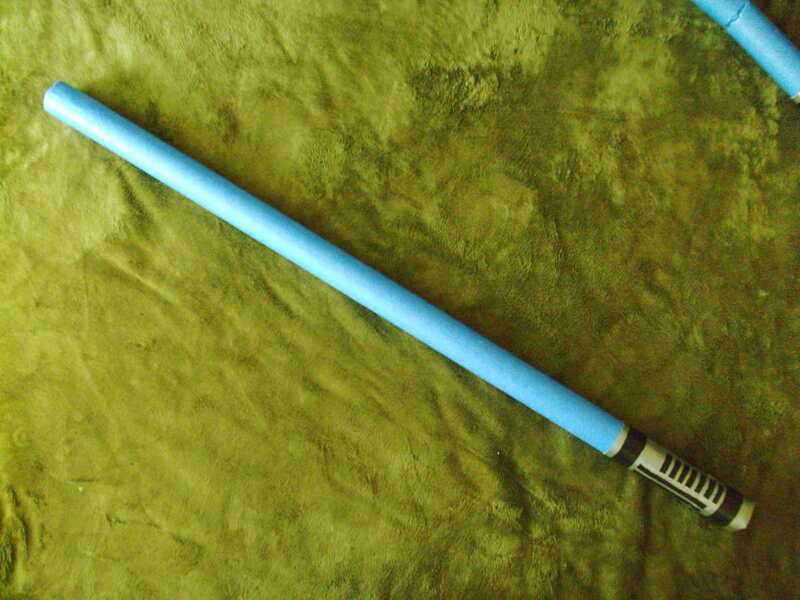 Museum-quality replica lightsabers are available. 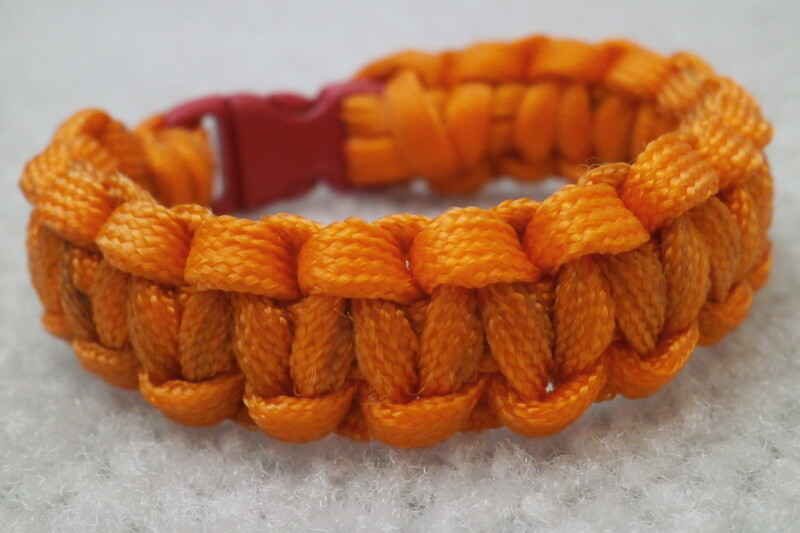 Some are just the handle, which you wear on your belt, and aren’t meant to be used other than as a prop. Some have a light-up blade and make noise. These are a special effect more than anything else, and aren’t meant to be used in mock combat for two reasons. First, it might not stand being jostled about and may break. 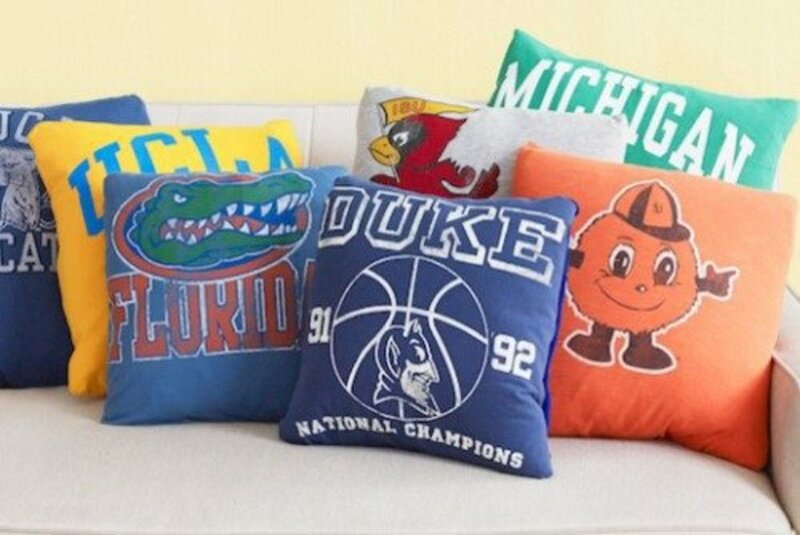 Second, you and your opponent could hurt each other with these. They’re also more expensive than water on Tatooine—not a good thing to give to your average ten-year-old. It reads pretty well, doesn't it? Lightsaber...with authentic battle damage! 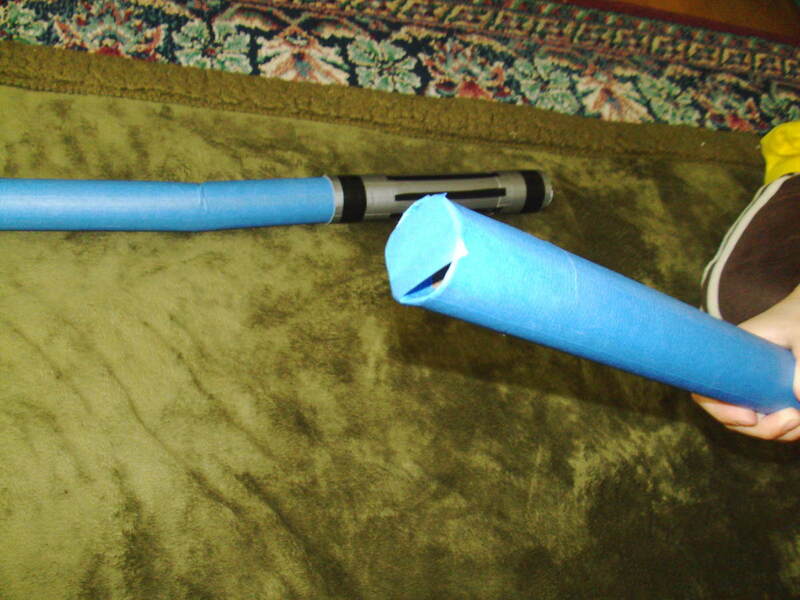 This is what a broken DIY lightsaber looks like. Don’t despair. I’m going to show you how to make a decent-looking toy lightsaber with a bunch of stuff you probably already have lying around the house. It will be light enough to be safe for use in mock duels, and it’s cheap enough to consider disposable. When it breaks (not if it breaks: it will break eventually, no question) it can be replaced in less time than it took to make it in the first place, because now you know what you’re doing. 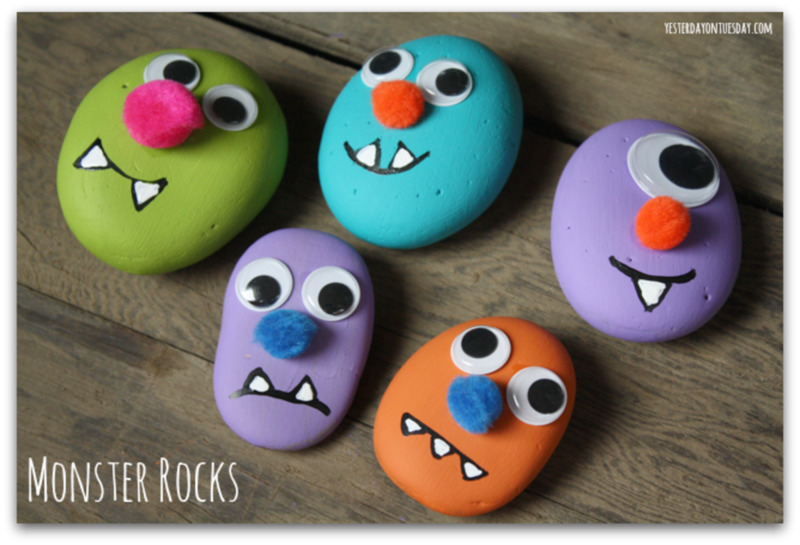 This is also a cool parent-and-child project. It can be part of your padawan’s Jedi training. Jedi knights are required to build their own lightsabers, after all. To make a lightsaber, you need the following items, most of which you probably already have lying around the house somewhere. 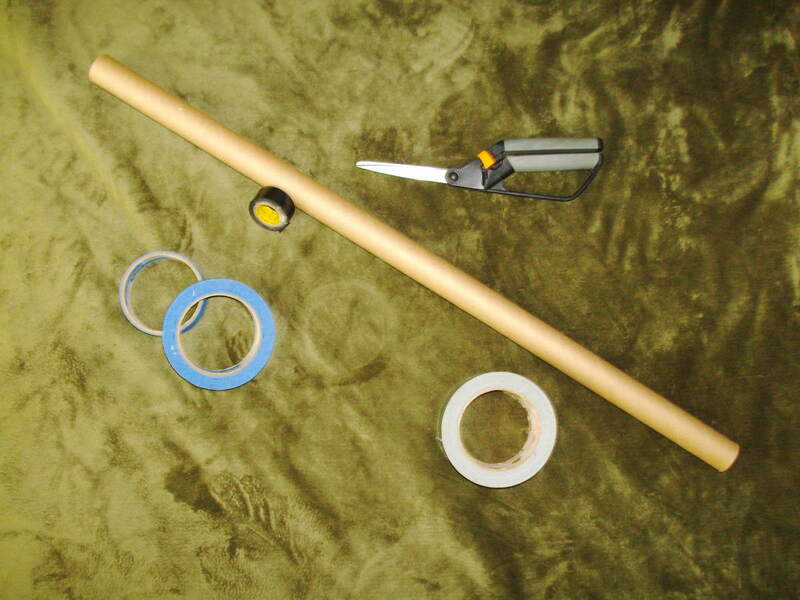 Take the carboard tube and the masking tape. 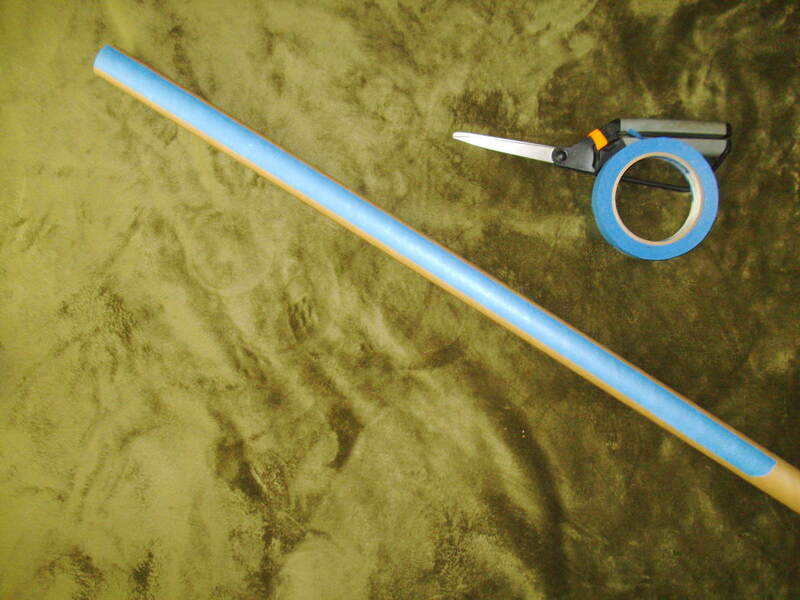 Unroll a length of tape as long as the tube. Be careful: it’s really easy to tangle up such a long length of masking tape. 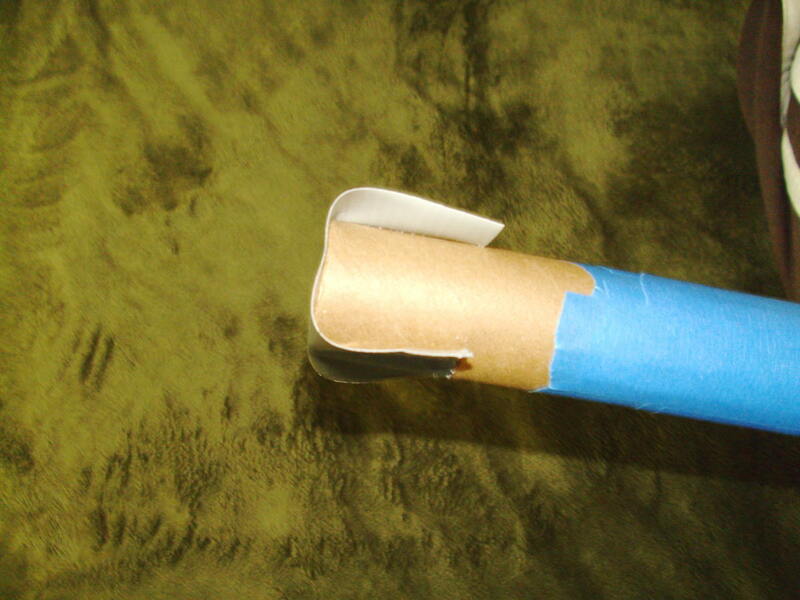 Stick the tape to the outside of the cardboard tube from end to end. 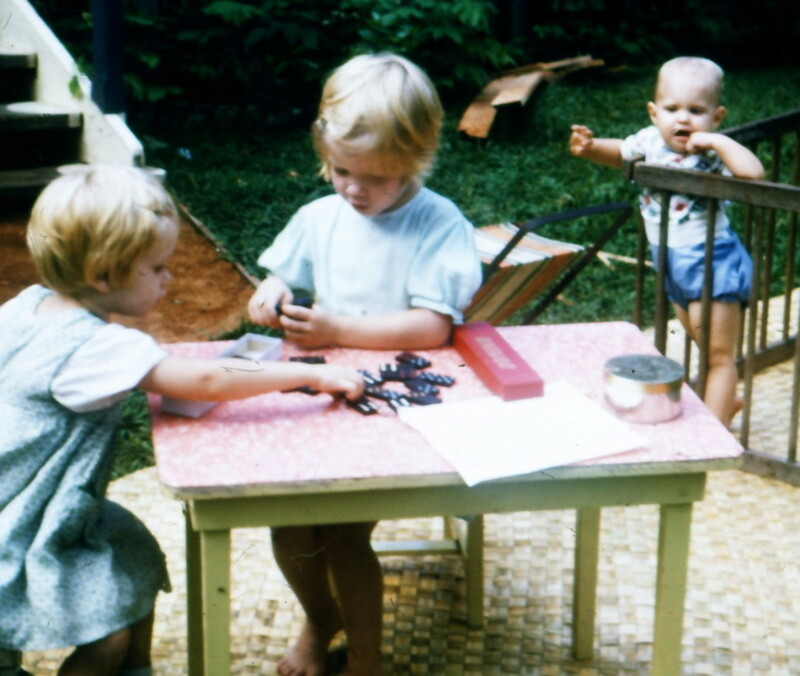 Make sure that it’s smoothly adhered to the cardboard with no wrinkles or bubbles. Now do it again, and overlap the first length of tape by about a quarter inch. Repeat. 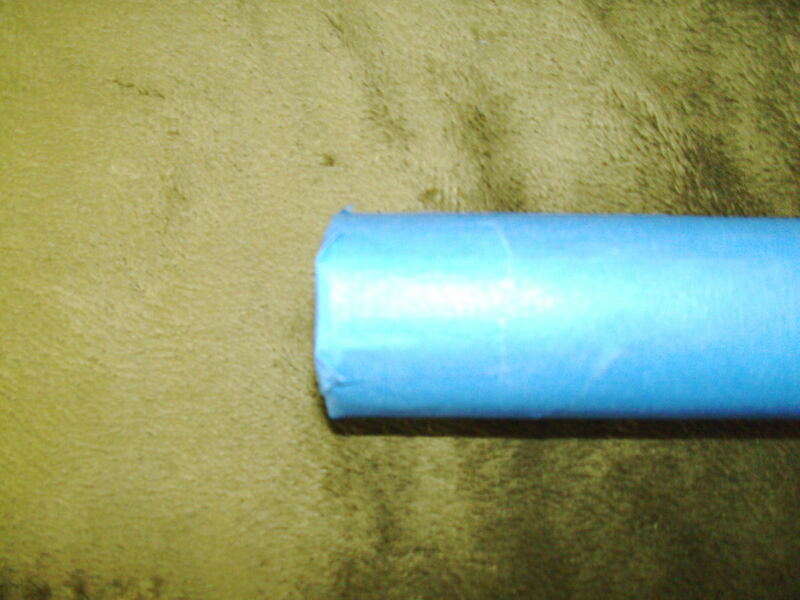 Soon, the tube will be covered with blue masking tape. Now let’s close one end. 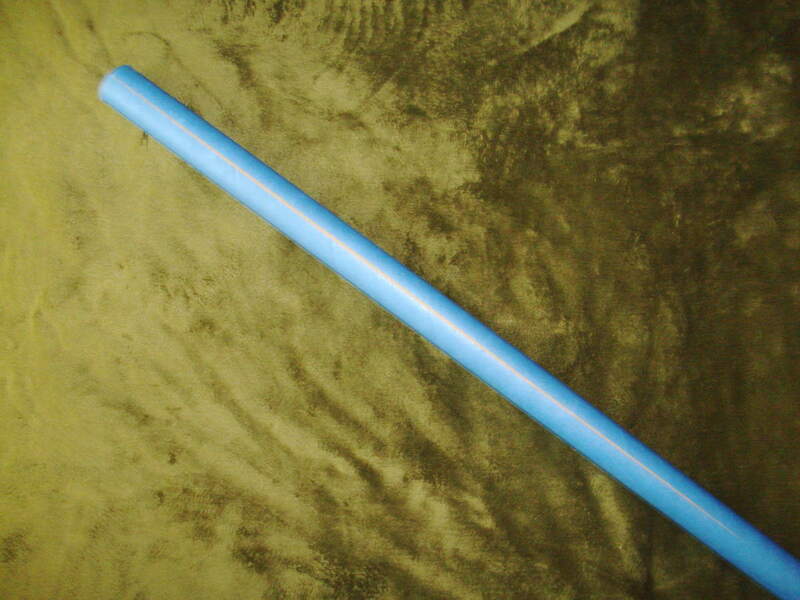 You're going to close the tip of your lightsaber with blue masking tape. 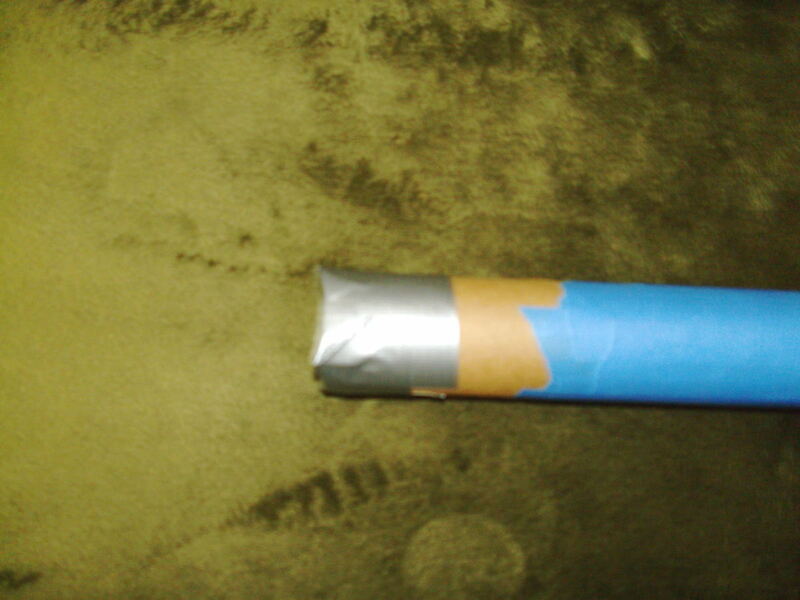 Take a short length of tape, between four and six inches long, and put the middle of it across the open end of the tube. 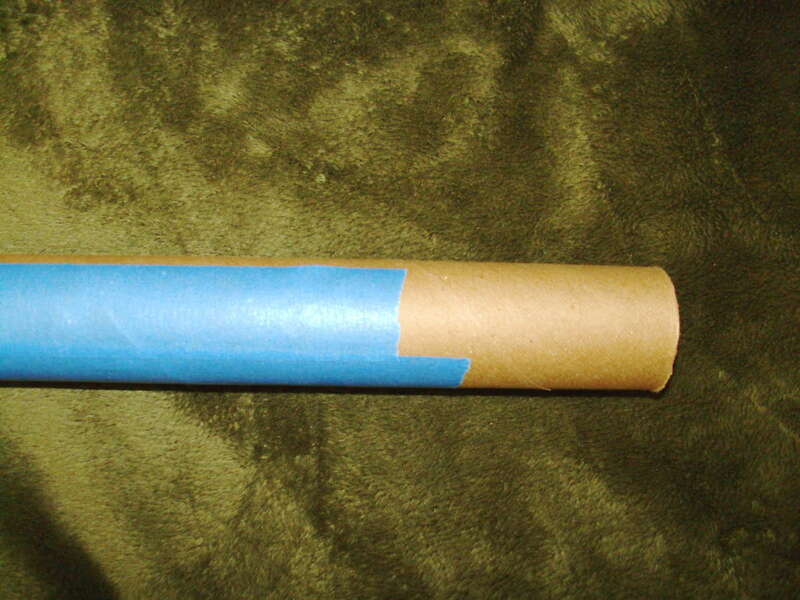 Fold each tape end down and smooth it over the tube. The end of the tube will not be closed. You will need to repeat this step, but overlap the tape, just like you did when you covered the length. Don’t worry about making the ends of the tape perfectly even at this point. 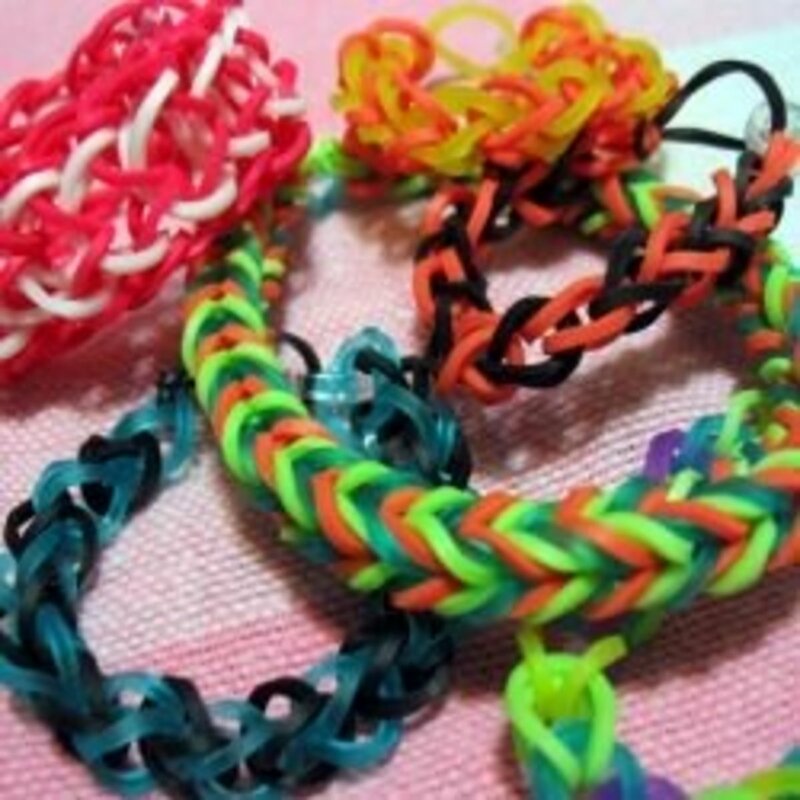 Just try to get them more or less the same length. You don’t need your scissors yet. 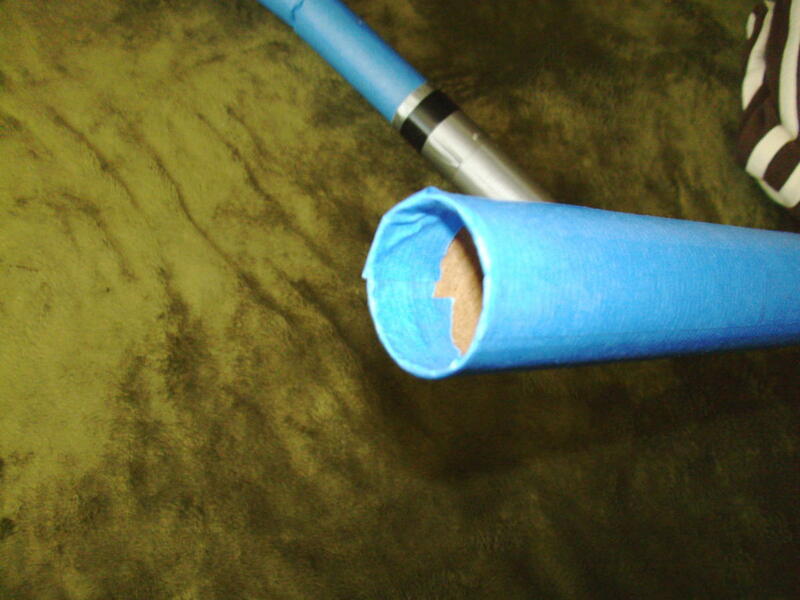 Once you’ve got the tip closed, you will wrap the end of the cylinder in blue tape to cover up the dog-ears where you folded the tape over the end, and to even out the ends of the tape you used to close the tip. This step is optional, really, but it makes for a much neater end product if the lines are clean rather than ragged. Use your scissors to cleanly cut the ends of the tape for this step. Now let’s make the handle. This is where you’ll need your duct tape. 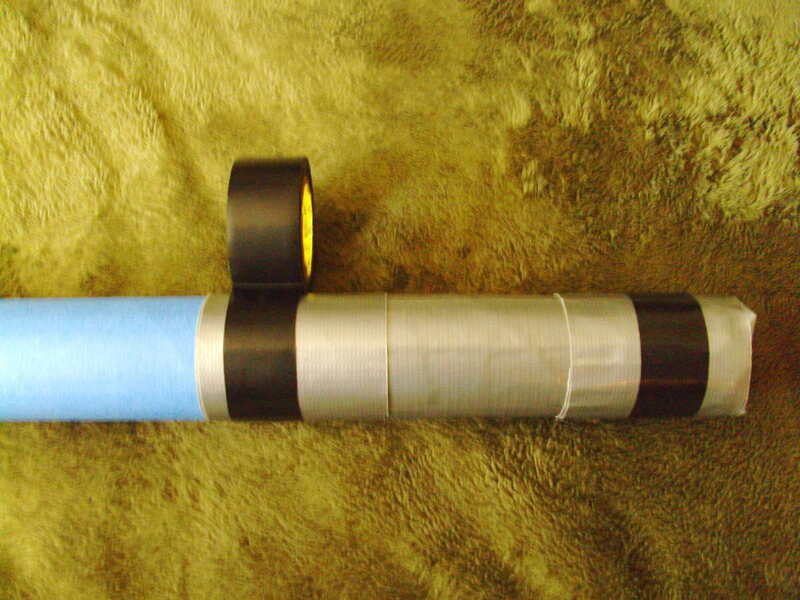 Use duct tape to close the remaining open end of the lightsaber exactly as you did with the masking tape, above. 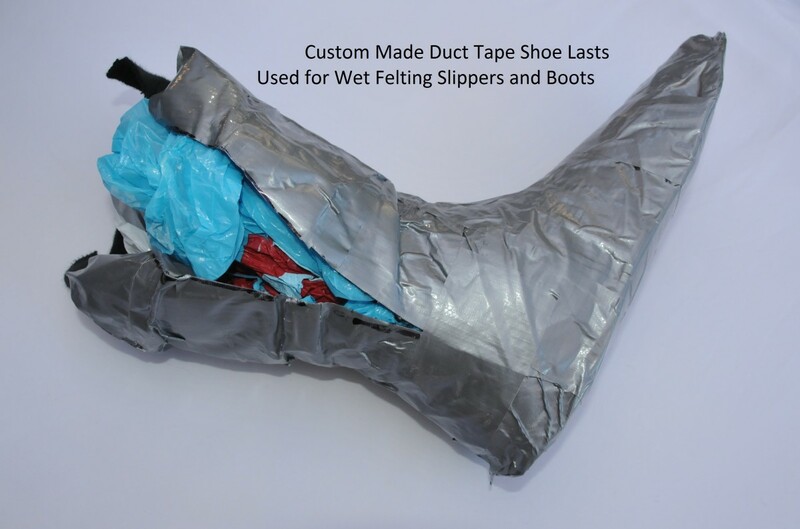 Use short lengths of duct tape, and trim the edges with your scissors. Duct tape is hard to tear cleanly with much control. Once the end is capped, decide how long you want the handle to be. 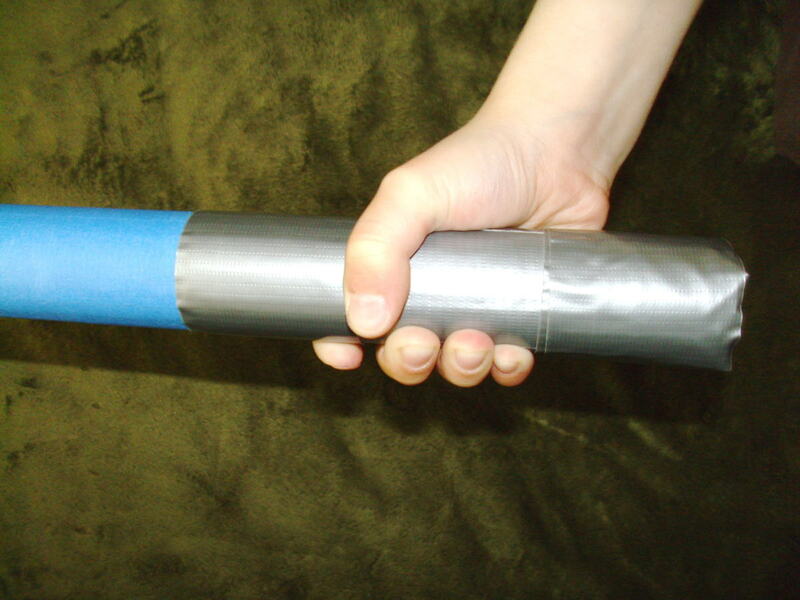 Cut a length of duct tape and apply it to the handle end of the cylinder, lengthwise. Repeat, and overlap the edges. Soon you’ll have a blue cylinder with one slivery end to it. 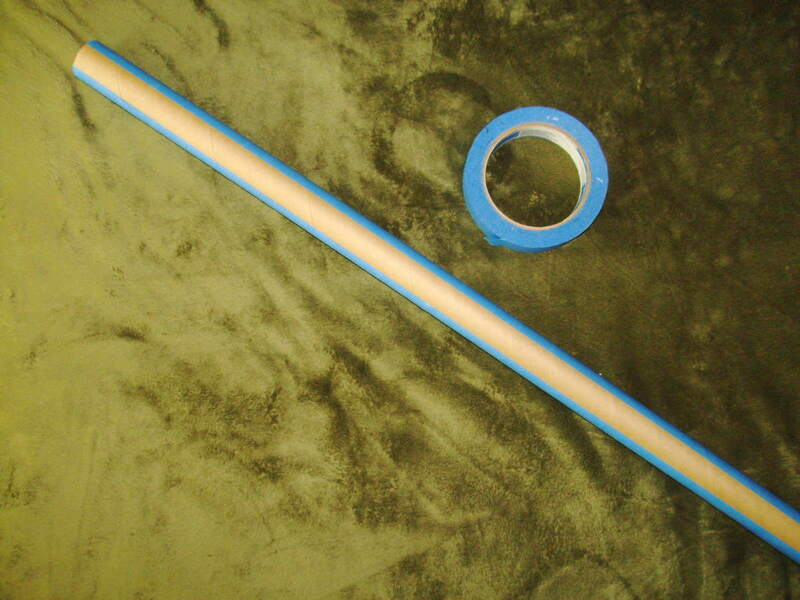 Use a short strip of duct tape to neaten up the edges of the handle as you did with masking tape at the tip. Trim the ends with your scissors. All you need to become a guardian of peace and justice in the Old Republic. 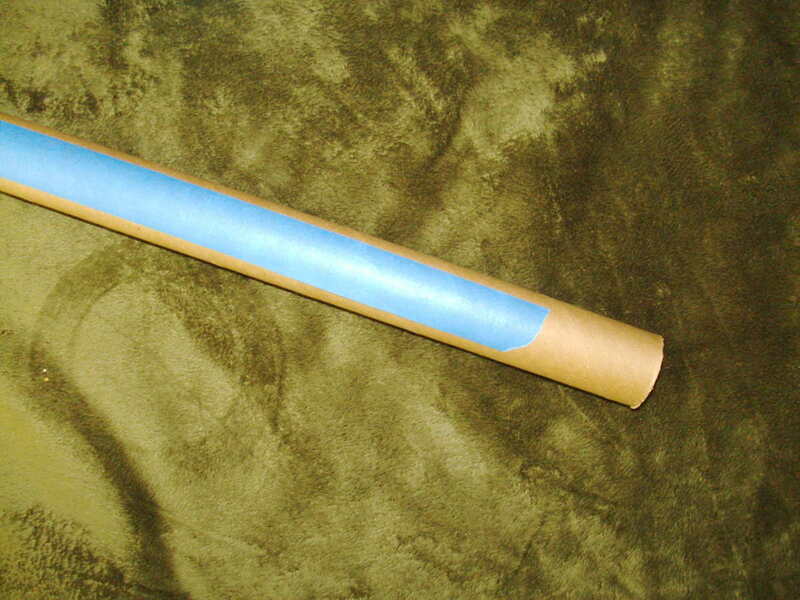 The first length of blue tape along the cardboard tube. 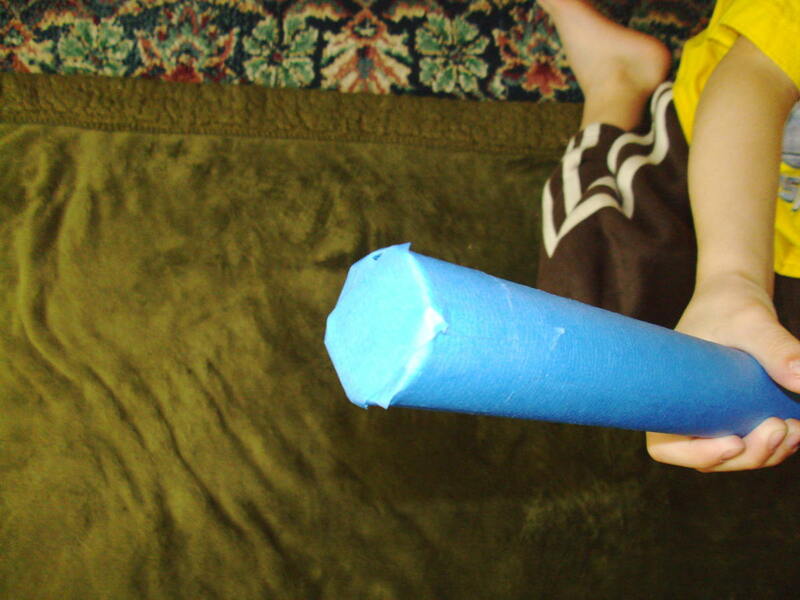 Fold the tape under at the tip. Don't worry about how the end looks; it's going to get covered up. 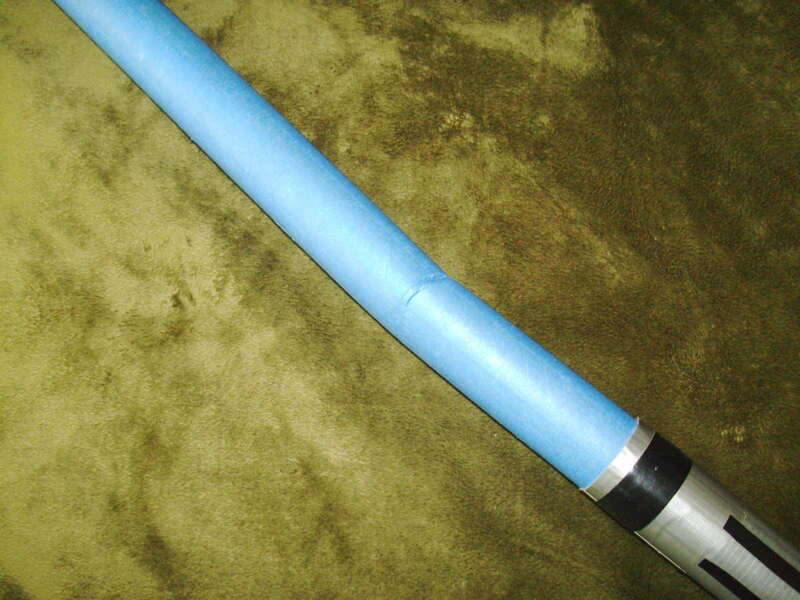 Closeup of the end after the second length of tape is added. Again, don't sweat the looks at this point. Ooooh, just a tiny strip of cardboard is visible. A second layer of tape all around couldn't hurt, really. The tip of the lightsaber. We'll cover it next. First layer of tape over the tip. Just tape right over the middle of the end, folding the corners. Don't worry about how it looks yet. Another length of tape, covering some of the bits that were left exposed. Do this until you've got the hole covered completely. 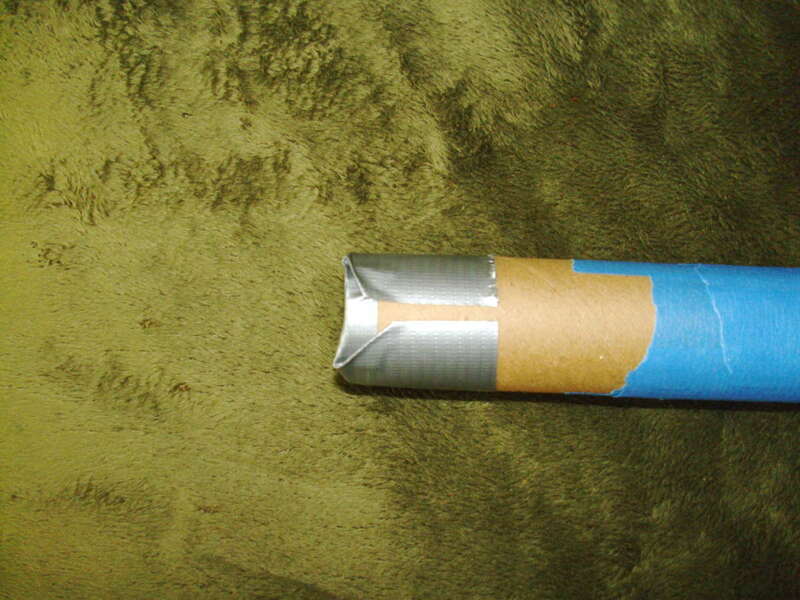 This is one of the only times you'll wrap the tape around the tube. Now you can pay attention to looks. Use your scissors to make a neat edge on the tape. Capping the handle end. Do as you did on the tip, but with duct tape. Two layers over the end works best. Now make the handle just as you did the blade, but with duct tape. Use your scissors. Duct tape doesn't tear cleanly. 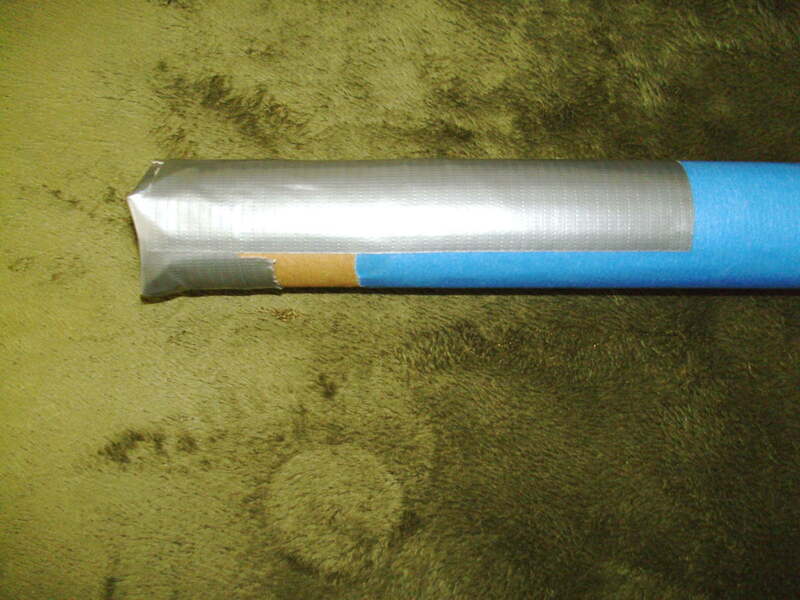 Wrap the duct tape around both ends of the handle to neaten up the edges. If you want, you can call your ’saber done at this point, but it will be much cooler if you add a few details. Get your electrical tape and your scissors. We’re going to cut thin lengths of electrical tape and use them to create o-rings and handgrips on the handle part of your lightsaber. Be careful when cutting the electrical tape and sticking it onto the handle; electrical tape is also easy to tangle. 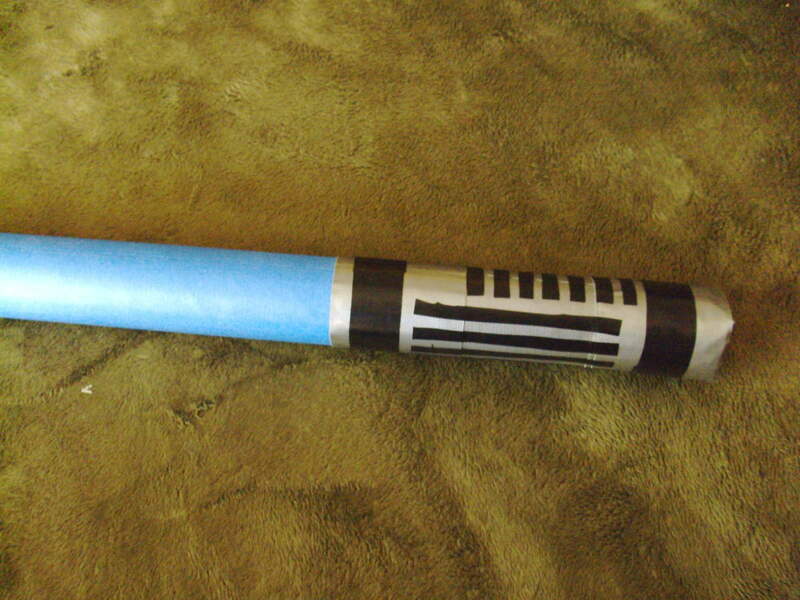 There is no “right way” to decorate your lightsaber handle. Some like their grips to run lengthwise, others prefer a series of o-rings for the grip. As long as it looks reasonably cool, it’s fine. Use electrical tape to trick out the handle. Cut grip-looking shapes with your scissors. 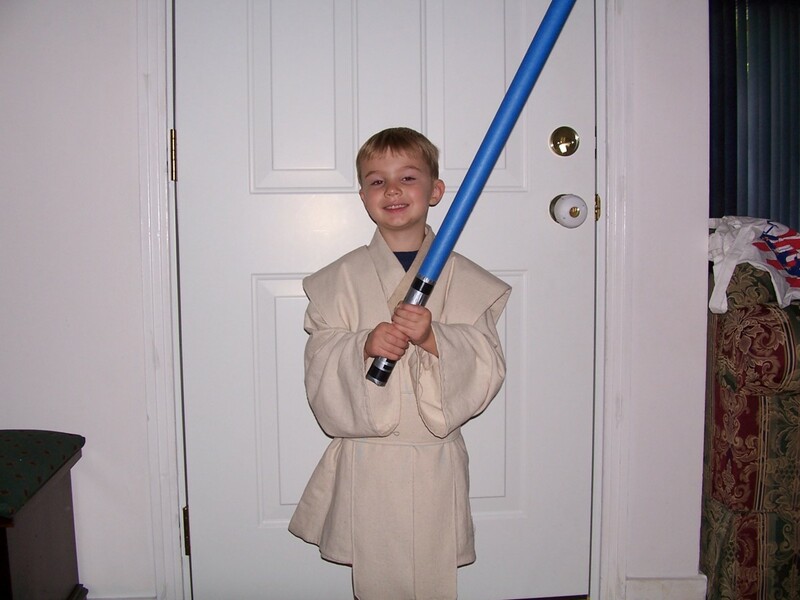 ...and a joyful padawan learner. You See? You Can Do It! 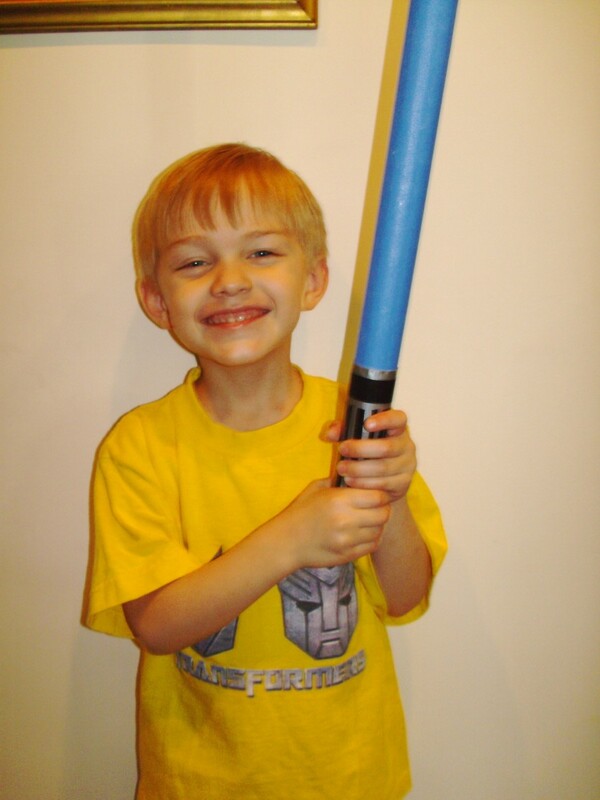 This DIY lightsaber project will be fun to work on with your kids, and it will look very cool with a costume. As I mentioned above, it’s light enough that even if your padawan gives in to anger, no arms will get chopped off. The worst damage that this lightsaber is likely to inflict is a bit of a sting. As a bonus, this saber won’t survive a full-strength swing. It will be a bit fragile. They’re not going to spontaneously break, and they’ll even hold up to a little light sparring (emphasis on the light). But if the kids swing at full strength, they’ll break their ’sabers and will have to wait until you feel like helping them make another one to have their next duel. This is why young Jedi must use the Force for knowledge and defense, never for attack. There’s no reason you can’t make your lightsaber more elaborate, if you feel like it. You could use reflective spray paint to make the blade more shiny. You could add an on/off switch to the handle with colored markers, or stickers, or even craft jewels and a glue gun. I haven’t tried this, but I suspect that you could use expanding foam insulation to make your ’saber more durable. I don’t know what this would do to the weight of it, though, so if you try this, it’s at your own risk. (If you do try it, let me know how it works for you, okay?) The more extras you add, the longer the project will take (a good lesson in patience for young padawans) and the more it will cost. 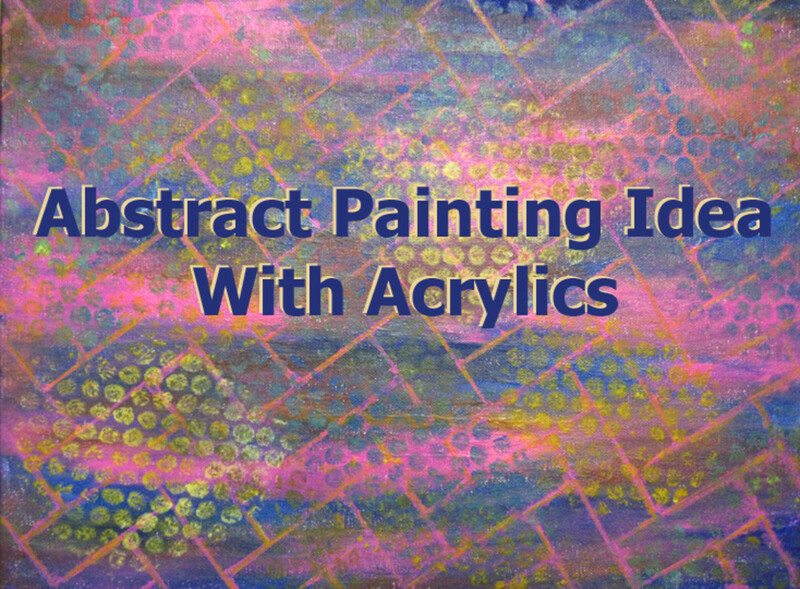 The project as described above will take you maybe 20 minutes and is practically free. Have fun, and May the Force be With You! The words Lightsaber, Jedi, Padawan, and Star Wars are the registered trade marks of the Lucasfilm corporation. Their use here is not to be construed as a challenge to their copyright. Glad you found this useful, Sarah! Happy Halloween! Thank you so much for posting this! I was trying to find a lightsaber light enough for my 2 year old's Luke Skywalker costume for Halloween and not having any luck till I found this and made him one. It looks fantastic and was so cheap and easy! Now I have enough tape to make a whole lot more, just gotta collect all the wrapping paper tubes I can empty this Christmas. Awesome hub Jeff Berndt. 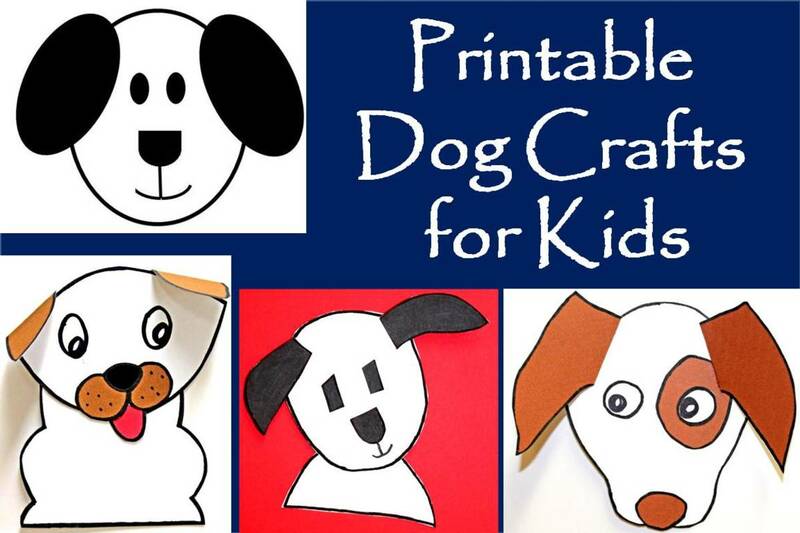 This will certainly help parents to make thing interesting for their children. Duck Tape over pipe insulation is a good idea. Those would hold up to sparring better than cardboard, and would still be light enough not to hurt--very clever. Tell me, though, do they stay straight after use, or do they get a little droopy after a few mock battles? I'm so pleased that you found the article useful. Let us know how the party goes, eh? This was awesome. My son's 10th birthday is this weekend and we are having a Jedi Training Party. 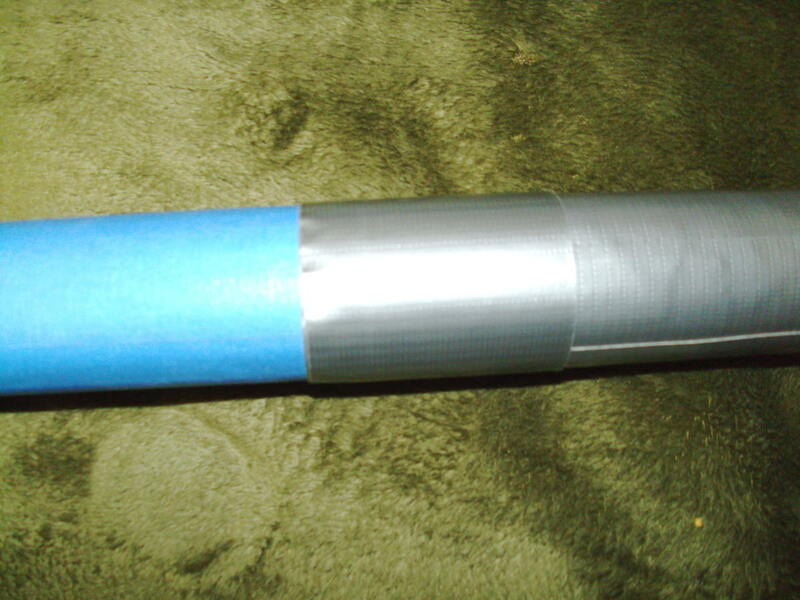 I tried several different suggestions for making a safe lightsaber for the kids to play with indoors and this suggeston came out the best except I used foam insulation for pipes instead of the cardboard rolls and colored Duck Tape so it stuck to the foam better. Thanks for the suggestions. My son and his friends are going to love this! Brilliant! I hope he loves it! Thanks, Steve. Making the 'saber light up would require some expensive components (not cardboard!) and more skill in wiring and soldering than I currently have. But making one that lights up is one of my goals. When I do it, I'll certainly write about the experience. Not bad! I like htat it's so cheap it won't matter much if you break it. Too bad it won't light up though. Cool....I have one of the nice lightsabers that lights up. I also have a couple old Hasbro ones (from the Mid 90's) which aren't too bad.